Earlier this week, in a scene that sounds like something cut from the Book Of Revelation for not being believable enough, some passing tourists witnessed the clash of two of nature’s most formidable beasts. The altercation was likely a result of the unspoken tension in the animal kingdom that comes with the knowledge that any predator may become prey under the right circumstances. Sharp teeth and gnashing claws were tested against brute strength and force of will as, for a moment, the order of the world was thrown into chaos by a single, violent strike. In short, a damn horse punched an alligator and it was cool as hell. The video, shot in Paynes Prairie Preserve State Park in (of course) Florida, picks up in the middle of the confrontation and doesn’t show what this alligator actually did to push the horse to violence. Maybe it said something derogatory about the horse’s mother. Or maybe the gator a notorious horse killer that’s eluded punishment for years. Or maybe it was nothing. Maybe this horse is the Michael Douglas in Falling Down of horses and he had simply just had enough. 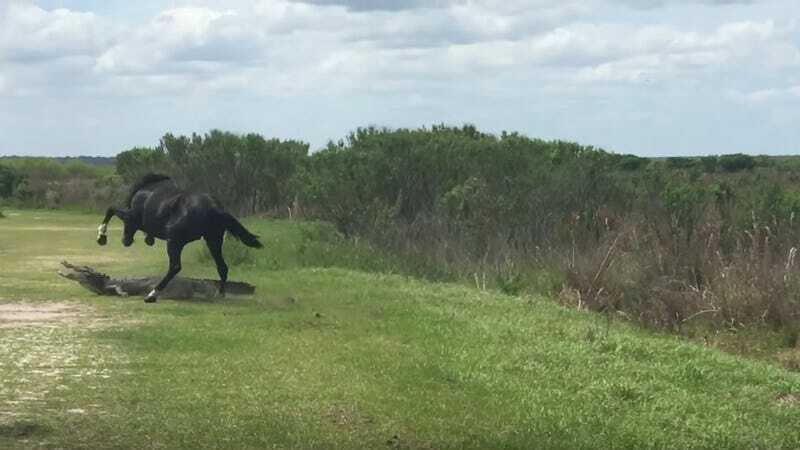 According to a Facebook post from the woman filming the incident, employees at the Preserve said, “There were no clear signs of distress/bleeding when [they] left the site.” So, as these two mighty beasts slink off to lick their wounds, the eternal struggle between horse and gator continues to wage on in the shadows, postponing its resolution until a later, undetermined date.